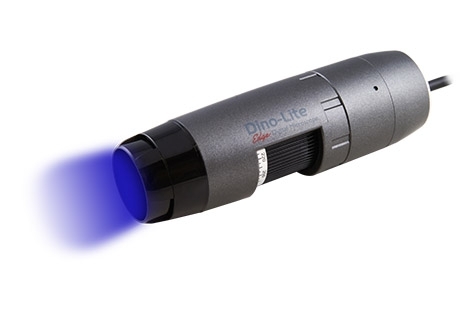 The Dino-Lite EDGE AM4115T-GFBW digital microscope is optimized for research and viewing objects involving fluorescent objects using blue LEDs for excitation and has a 510nm emission filter that is designed to observe green fluorescence including but not limited to GFP (green fluorescent protein). The AM4115T-GFBW has a 1.3 Megapixels sensor that you can capture or record at 1.3 Megapixels resolutions, and can magnify up to 220x magnifications depending of working distance. Green fluorescent objects pop out under this handheld microscope and you can clearly see its green glow. If you need to observe without this special feature, it also has the capability of switching the light source from the excitation lights to white light which provides the convenience of locating and focusing on the object. Switch back to the main lighting for capturing green fluorescent objects. The Dino-Lite EDGE AM4115T-GFBW is the perfect tool for looking at green fluorescent objects as it is built to make it stand out. With its ability for high magnification and compact handheld size, it is also a space saver and all in one unit for picture and video of magnified green fluorescent objects. The AM4115T-GFBW is a desirable tool for researchers and users alike who are searching for a valuable tool in examining green fluorescent specimens.